January 15, 2018 January 14, 2018 by Beau H.
Layered up to catch The Killers in Philly. My Taylor Stitch Albion Jacket and Flint and Tinder All-American Jeans were perfectly casual, rugged pieces for the occasion, along with a Philadelphia-centric United By Blue Bison Cap! As I sit here to write this post, I’m reflecting on an amazing, music-filled weekend … and I’m listening, of course, to one of my favorite bands of all-time … that’d be The Killers, my friends. Led by frontman Brandon Flowers and his ever-changing bevy of stylish tailoring and outerwear, they’ve been a band I’ve looked up to for years, all the way since my days as a middle school and high school student back in Michigan. I’ve taken the chance to see them as often as I possibly can, from Governors Ball 2016 to last year’s Lollapalooza in Chicago, and I even took two trains and a ferry to see them play in New Jersey last summer. All those evenings have been, simply, the best shows I’ve ever seen! So when this tremendous band announced a new album — the aptly titled “Wonderful Wonderful” — and a tour that brought them up and down the East Coast, I knew I had to hop on board and catch them as many times as possible. That meant an absolutely stellar Tuesday show in Brooklyn, a standout Friday night affair at Madison Square Garden, and of course … a trip down to Philadelphia for one heck of a Saturday night show! There’s nothing I love more than traveling for a bit of live music, so I brought my favorite #menswear with me. I even hit up some new spots in Philly — join me, and turn up your favorite song by The Killers … starting now. It was a busy weekend in the city given the NFL playoffs, which only added to the electric atmosphere. The right gear for rocking out and rocking through a day at the office. The weekend’s fun really started in earnest on Friday, as I dressed for both a day at the office and a Friday night at Madison Square Garden. It’s a lifetime venue for me, and I’ve already been fortunate enough to see some lifetime shows there — including the immortal AC/DC back in September 2016. Following my Tuesday night show at the Barclays Center, with general admission standing tickets in hand no less, I was absolutely just as excited for this extraordinary band to hit the stage on Friday night. To stay warm on a chilly New York day, I bundled up from the ground up, starting with my rugged, durable Allen Edmonds Caen Cap Toe Boots. With stellar construction and a silhouette that’s surprisingly refined, these boots will work for you at the office or a concert in equal measure. And they teamed up quite well with a pair of slim Mott and Bow jeans, a classic men’s denim option that’s also office-friendly. On my top half, I stayed warm with my Taylor Stitch Jack Shirt in Indigo Star — always a favorite men’s style essential. I supplemented that with the toasty, sports-inspired Life/After/Denim Collegiate Cardigan, as classic of a rugged winter cardigan as you’re apt to find. It all made for versatile, laidback gear that — when teamed with my Taylor Stitch Maritime Submariner Jacket — got me to and from the show in fine style. On my wrist, my Timex x Todd Snyder Military Watch kept me on time more than effectively. Of course, it was crucial that I show up early and get ready to rock. When you find yourself heading to the office, followed by a rock concert, reach for casual, rugged layers and tough-yet-tailored boots. And as to the offering on tap? Simply one of the most hit-packed sets you’re apt to find, filled with soaring, beautiful songs, from “Read My Mind” to “A Dustland Fairytale” and the driving power of “For Reasons Unknown,” plus fan favorites like the dance-ready “Human” and the electric “Spaceman.” New hits like “The Man” set the tone for this band early on, too; Brandon Flowers hardly even misses a note! It makes for an emotional, simply incredible evening … and that’s even before the band closes with “When You Were Young” and the iconic “Mr. Brightside,” a song that launched my interest in modern rock music to this day. To stand in a crowd and experience that with thousands of other fans is simply … awe-inspiring. There’s nothing like it, and that’s absolutely why I had to hit the road for round two on Saturday morning! The right gear for braving the cold, from sturdy CAT Footwear boots to a tough Grayers waxed canvas jacket and a classic elbow-patch shirt from Todd Snyder. For an early morning train ride down to Philly, I dressed in suitably layered cold-weather style, from a classic Flint and Tinder marled henley to my reliable, warm Todd Snyder Hemingway Elbow Patch Shirt, a personal winter style essential. I capped off that combo with the tough, sharp Grayers Edgeware Coated Cotton Moto Jacket, a slim-fitting, cold weather-ready jacket that I also took with me on a December trip to Toronto to see The National (yep, those guys again). I found the combo worked well for mobile travel style, especially when matched up with a trusty black pair of the Abercrombie & Fitch Langdon Denim, perhaps my favorite pair of jeans at the moment (and equally fitting given Mr. Flowers’ penchant for sporting black jeans or trousers himself). I had to make sure my accessories were both durable and stylish, too — enter a pair of rough-and-tumble CAT Footwear boots (the Abe Canvas is shown above), plus the WP Standard Officer’s Belt in Natural, a handsome belt that’s only gotten better with age. 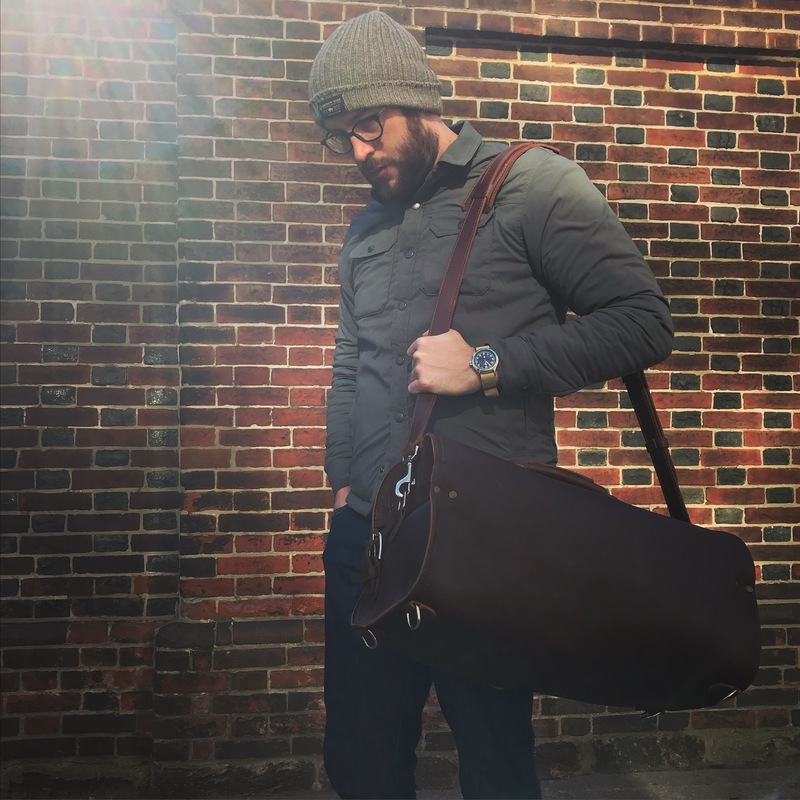 I finished off the combo with my equally durable Timex x Form-Function-Form Horween Leather Weekender, a crisp-yet-casual watch that kept me on time from the second I arrived in chilly Philadelphia. I’d been to the city only very briefly for my June trip to see The Killers, so I knew there was more that I wanted to explore on foot — powered by coffee from Rival Bros. Coffee, of course. I can never turn down an Americano or a cappuccino, and I was more than ready to power through more of the city. I knew I had to stop at the flagship outpost of one of my favorite brands at the moment — that would be United By Blue (makers of the Holt Work Shirt, as you might have seen in this site’s Style Pick of the Week series). The brand focuses on sustainable style done right, removing trash from our oceans and waterways with each purchase — that sustainable, stylish and craftsmanship-friendly approach is reflected in the brand’s neatly appointed store and coffee shop, perfect for kicking back and relaxing a bit on a chilly winter Saturday. 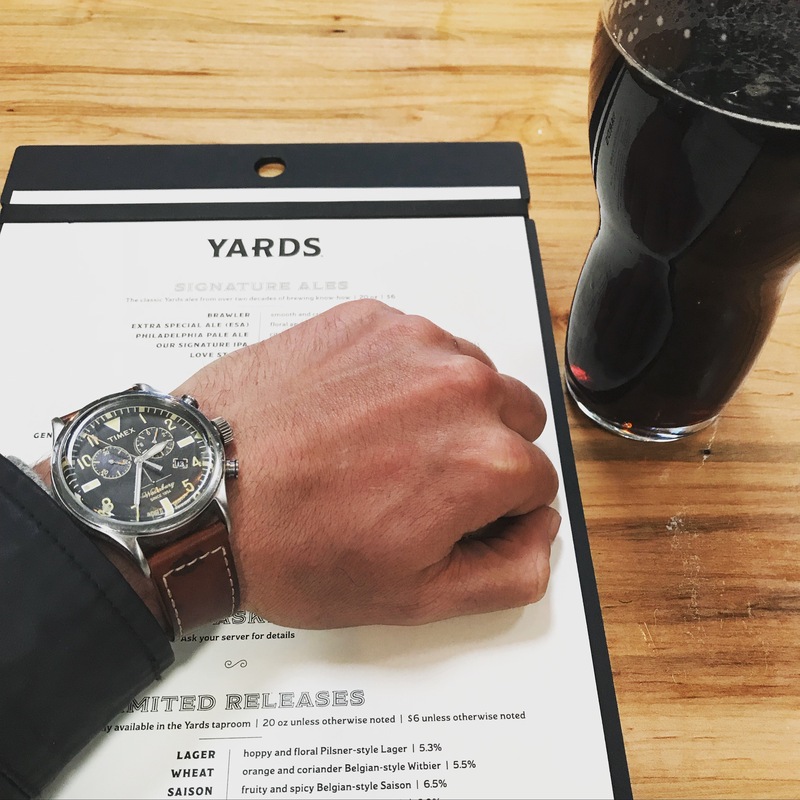 My Timex x Red Wing Heritage Waterbury Chrono, always a favorite of mine, was a nice accessory for the day alongside the General Washington Tavern Porter from Yards. If you know me, I’m never one to turn down a great brew … right? The chance to check out Philadelphia’s own, much-acclaimed Yards Brewing was one I simply couldn’t pass up. The brewery’s Tavern Porter is not to be missed, nor is the Cape of Good Hope IPA — cheers! And before the show, I knew from my last trip that I had to stop by Cinder, which poured a terrific mix of standout craft beer and cocktails alongside rich, warming dishes like hangar steak and fish & chips. All of which is to say … I was more than prepared and well-fed to see The Killers play yet a third stellar show in one week! There are arguments to be made for seeing a band just once, and there are arguments to be made for seeing a stellar, nearly life-changing band as many times as possible — at least, that’s my philosophy. It’s one that I think makes sense when you consider a generation-defining band like The Killers, who’ve certainly changed my life for the better … it made the show all the more meaningful, even if I did guess (correctly!) that they’d open with new hit single “Wonderful Wonderful” once again. I enjoyed my time at the Wells Fargo Center immensely, and I left grinning ear-to-ear. Covers of both “Romeo and Juliet” and “Shadowplay,” both live fan favorites, went over very well, to say the least. And an encore featuring “Andy, You’re a Star” was a welcome treat, too! Even after three shows in a short span of time, it’ll never get old hearing some of my all-time favorite songs sung by one of my all-time favorite performers. In short, if you get the chance to go see The Killers on this particular tour, or heck … ANY tour … please, take it! It was certainly worth the trip to Philly, and I tried to make the most of my time in the city on Sunday before heading back to NYC. To kick off my day the right way before heading back to NYC, I’d heard great things about Old City Coffee, a charming space in near historic landmarks like the Betsy Ross House. It was a treat to visit, and made for a nice start to the day. It’s a good thing that I was bundled up to check out more of Philly, as Sunday proved a chilly one in the City of Brotherly Love. 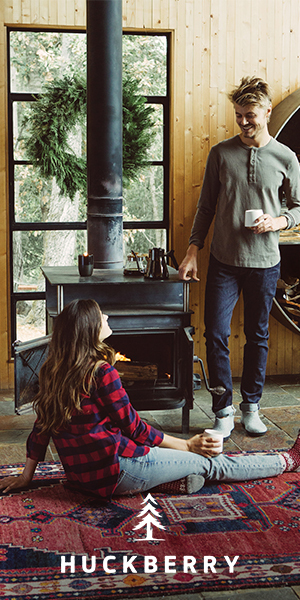 My classic Flint and Tinder All-American Jeans were both comfortable and casual, a nice pairing with my remarkably warm and toasty Taylor Stitch Albion Jacket, which I threw on over a rugged winter henley from J. Crew. In keeping with the casual theme of the day, my Todd Snyder x P.F. Flyers Rambler Hi Sneakers were sporty, easy to wear and suitably low-key enough for the rest of my outfit, as was my Timex x Todd Snyder Military Watch; as I always say, never skimp on accessories, your wrist game included. With my train incoming, I grabbed my Saddleback Leather Rounded Leather Duffel and looked forward to a ride north to NYC — The Killers played in my headphones all the while, of course. As I’ve said before, there’s nothing to compare to an amazing, extraordinary night — or two nights, or three nights — seeing your favorite band. I felt that remarkable feeling three different times this week, and each show was special in its own way. As long as bands like The Killers keep stepping up to the plate and delivery incredible experiences, I’ll keep hopping on trains — and maybe even planes! — to go see them. Have questions on what to wear to your next rock concert? Feel free to hit me up on Twitter. Thanks for reading, and thanks for being here as we start 2018 off the right way!